Thanks Giving is only weeks away! Every year I scramble to get everything ready in time. This year I am planning early and having a stress free holiday. What kind of holiday person are you? Christmas decorations before or after Thanks Giving? 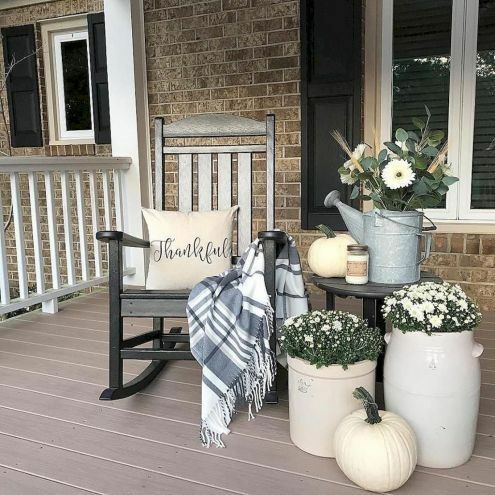 Usually we wait until the weekend after Thanks Giving, but this year we were planning out our decorations and ended up putting half of them up already. We are currently half red buffalo plaid an half white pumpkins. It takes us so long to put up the decorations I just want to make sure we have a full month to enjoy them! 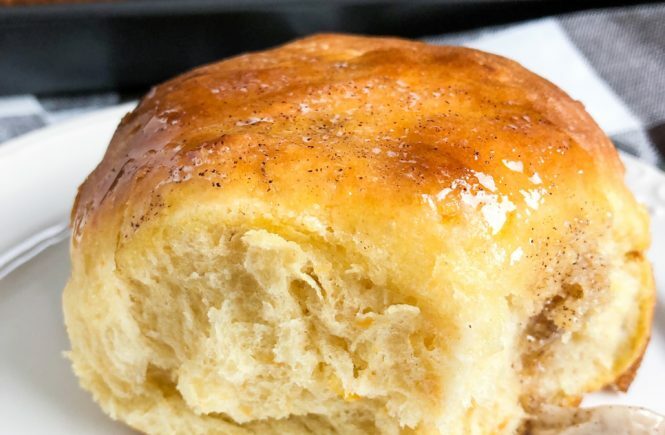 Now back to these sweet potato rolls. 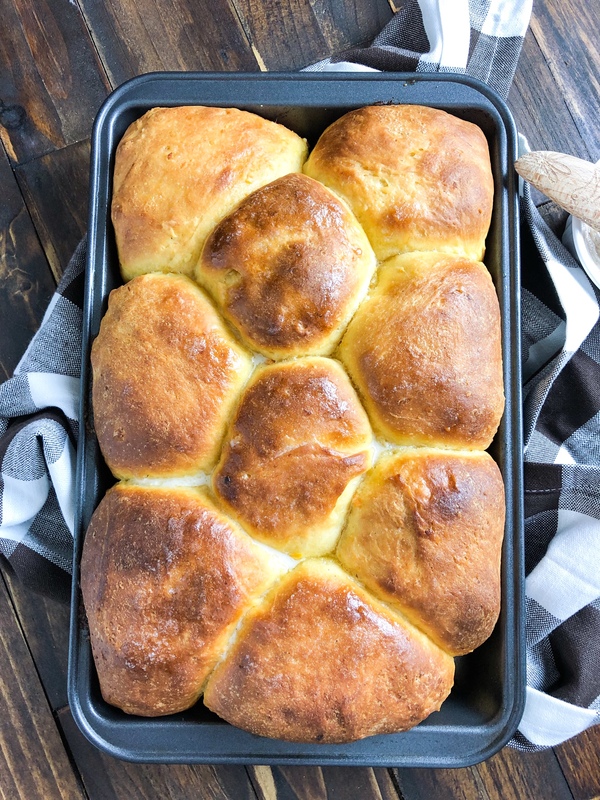 Patrick hates all things sweet potato and these are his favorite dinner rolls I have ever made. I have yet to tell him what they are made with … oops! They always turn out so perfectly sweet and fluffy. This time I made a cinnamon honey butter that paired so well with them. Usually I make this dough in my bread machine, but this time I used the dough hook on my kitchen aid. The dough came together in minutes! 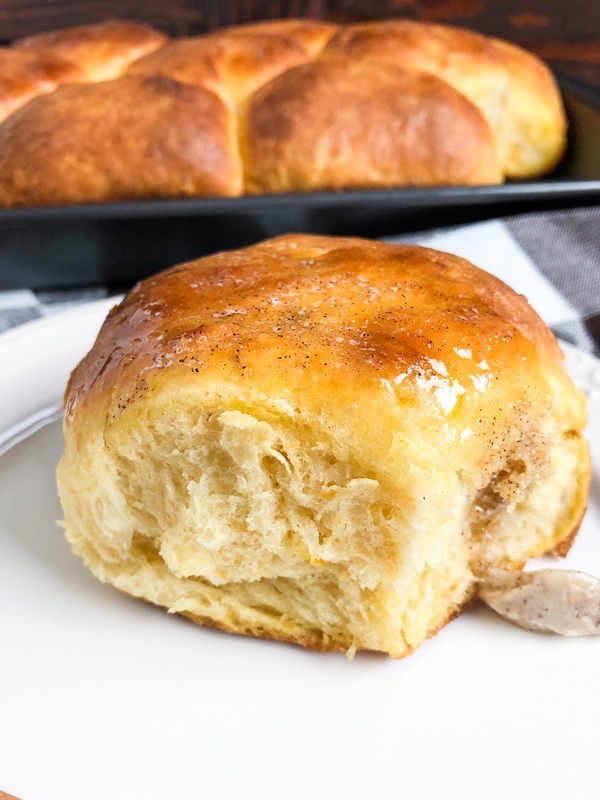 Light and airy sweet potato dinner rolls. If you want to try the butter just mix a tsp of cinnamon and a tsp of honey into 1/4 cup of soft butter. Spread onto a warm roll and enjoy! 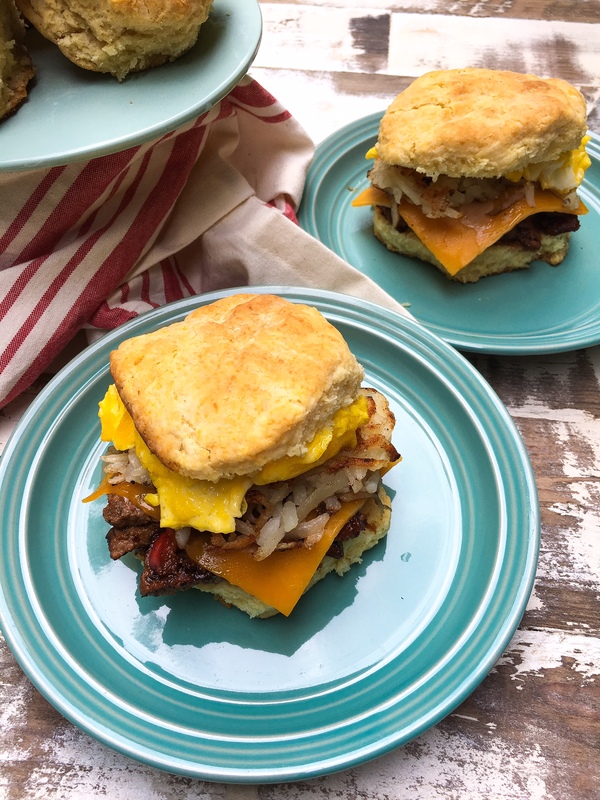 Biscuits scream brunch to me. Especially when they are warm and fluffy. 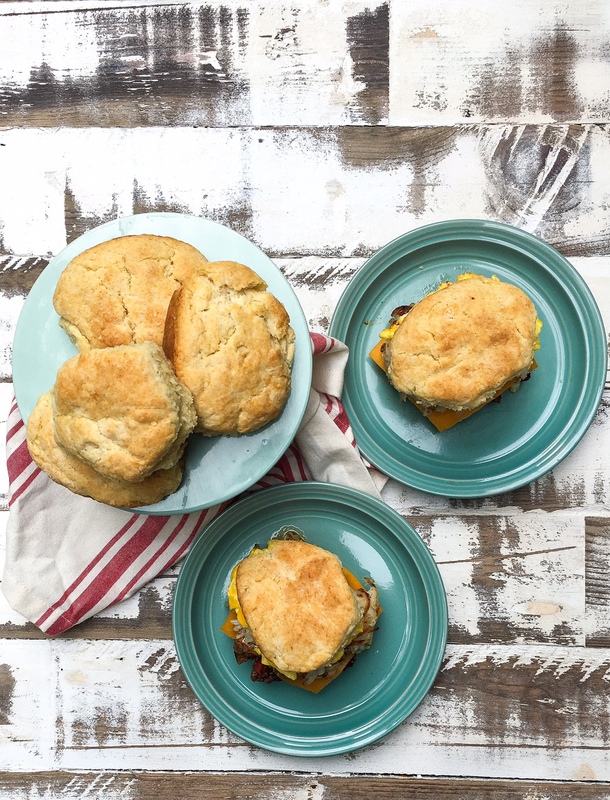 These steak egg and cheese biscuits are so moist I recommend eating them with a fork! On Saturday nights I work late so we typically eat something quick and easy. Last night we grilled some onions, colorful peppers and carne asada for fast fajitas. They were delicious and I made sure to save a little for today’s brunch. While we were in Savannah we went to our favorite breakfast stop, Clary’s Cafe, a few times. They have these giant pillow-like biscuits that honestly do not even need a filling. Pretty much anything you order at Clary’s is going to be delicious. Everything is made fresh with local ingredients. 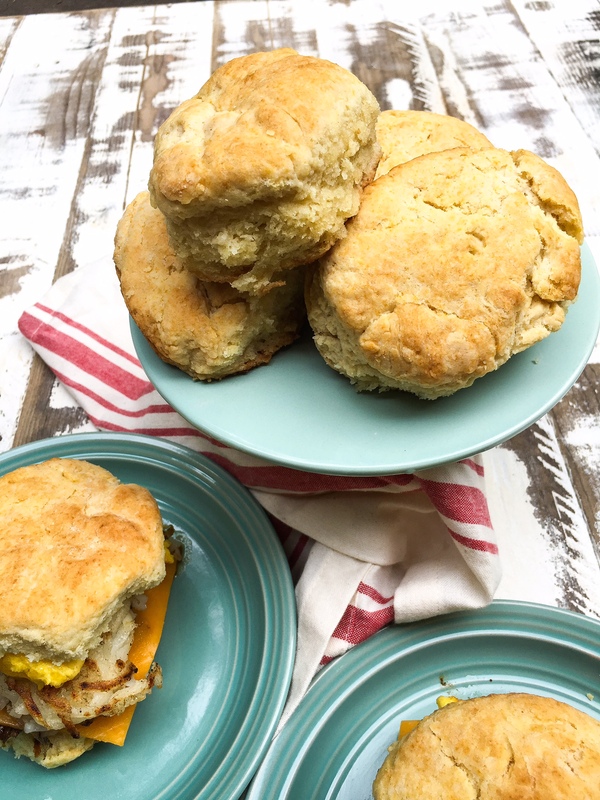 I wanted these biscuits to me made with ingredients that everyone probably already has at home. 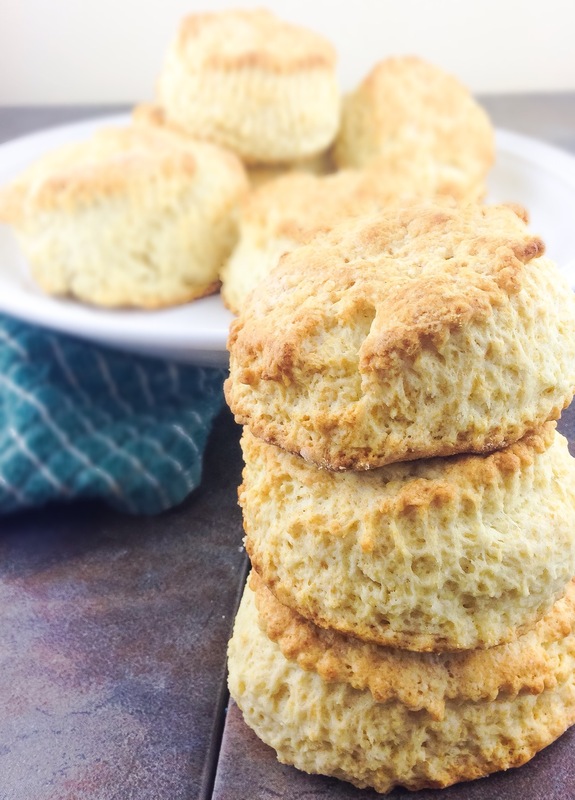 I rarely make biscuits without buttermilk, but I really wanted to only use what I had on hand. 2% milk worked perfectly in this recipe. I wanted to get as much texture and flavor as I could by using only a handful of ingredients. I used just a little bit of garlic powder to compliment the steak. 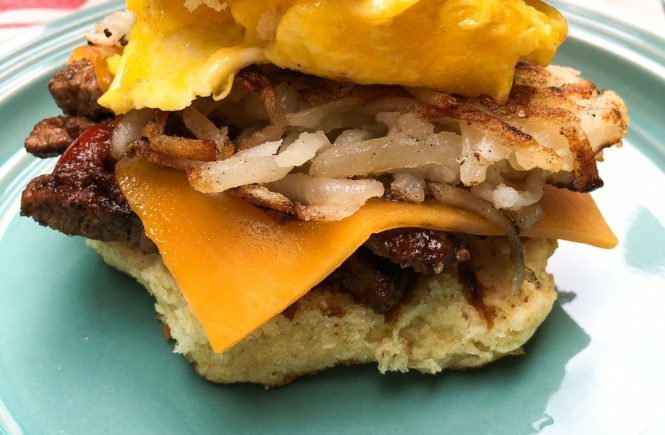 I added hashbrowns last minute to have another layer of texture. Definitely give these biscuits a try. This is one of the most forgiving recipes I’ve ever made. The thicker the biscuit the better the result in my opinion! Enjoy! 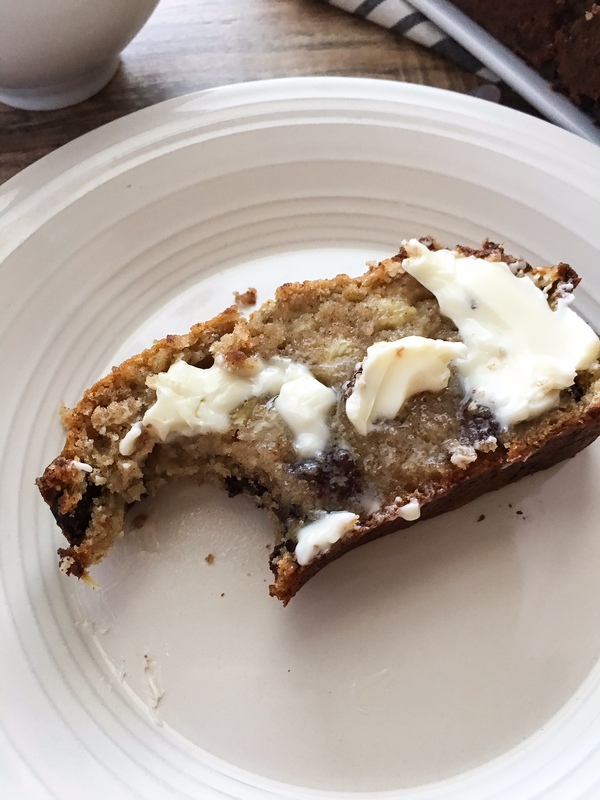 Don’t forget to #kelliericecakes if you try the recipe! It feels so good to be back after two weeks! 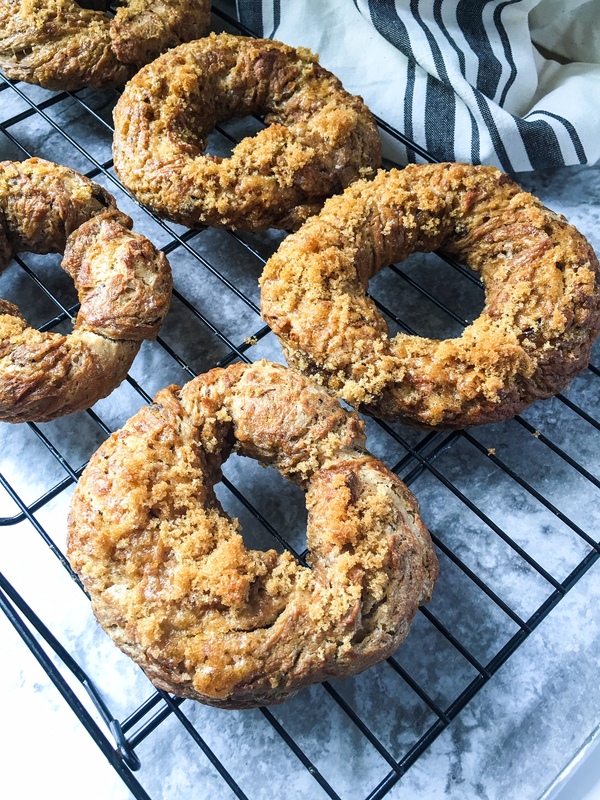 I have been stock piling recipes during my absence and I’m pretty sure these Brown Sugar Raisin Bagels are the best thing I’ve made in ages! March was one of the busiest months I’ve had since the holidays. We had a huge joint birthday party for Patrick’s kids. That alone took two weeks planning and 3 days of prep work. I started a new position at work that actually has a better schedule, but it completely threw off the days I usually reserve for pictures. Now I am trying to find ways to use my artificial lights. These gorgeous bagels came to life early one morning so I was able to take advantage of the morning light. Eventually I will find a way to balance my work and blog, but for today we are just going to dive right into these bagels. We were grocery shopping a few weeks ago and saw a little tub of brown sugar cream cheese. Now I’m sure I have just been living under a rock, but I had no idea this stuff existed! 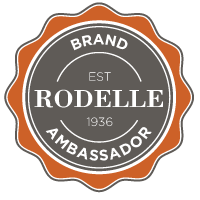 Here is just a little insight into how my recipes come to be – first ingredient cream cheese. 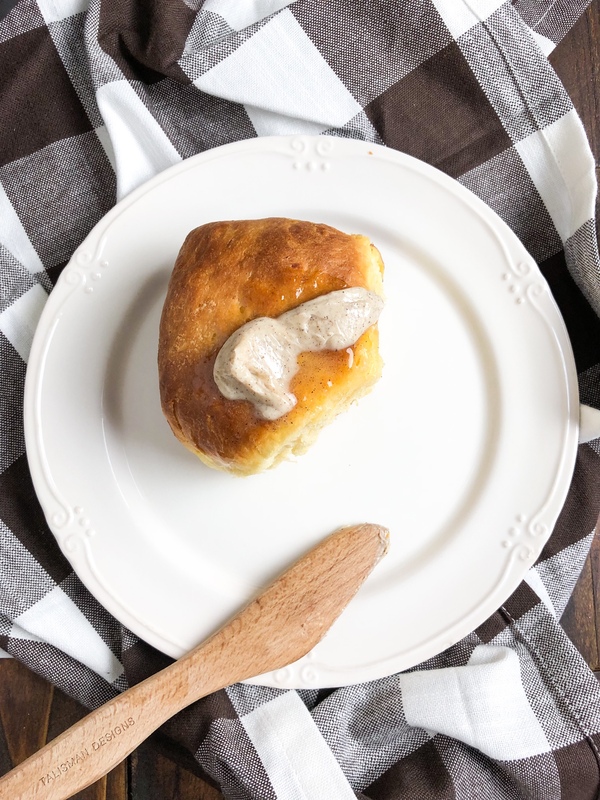 Now what is the best way to savor a spoonful of brown sugar cream cheese? More brown sugar obviously! Next raisins because I wanted a little extra flavor. I wasn’t really sure if I was making a bread or bagels until I got home. I really wanted a nice crust so I knew it was going to be bagels. These have the perfect chew with a nice crust and more brown sugar crumble. 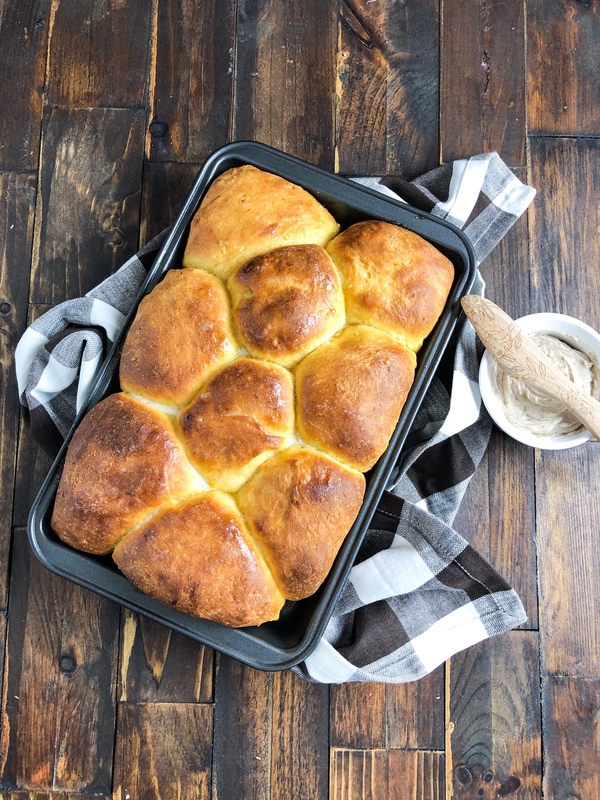 They were pretty much perfect to slather with cream cheese! 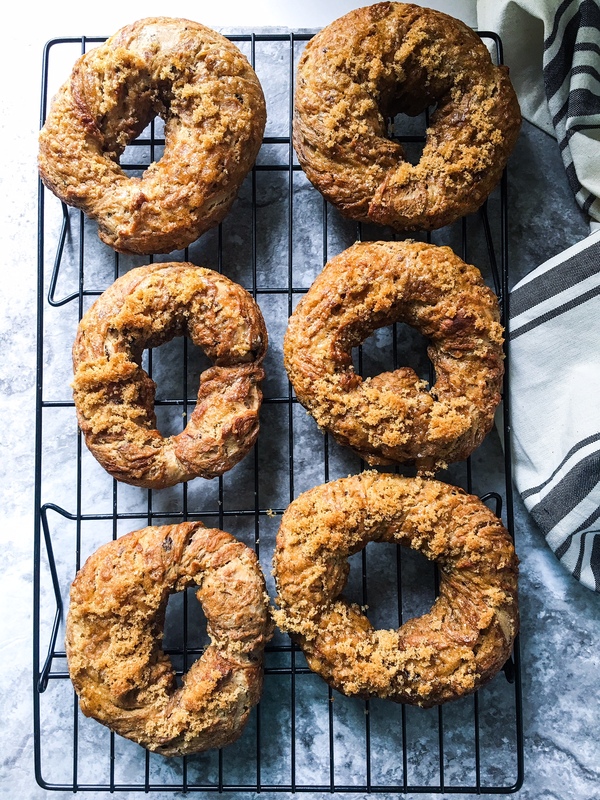 Chewy bagels with crisp tops and brown sugar crumble. 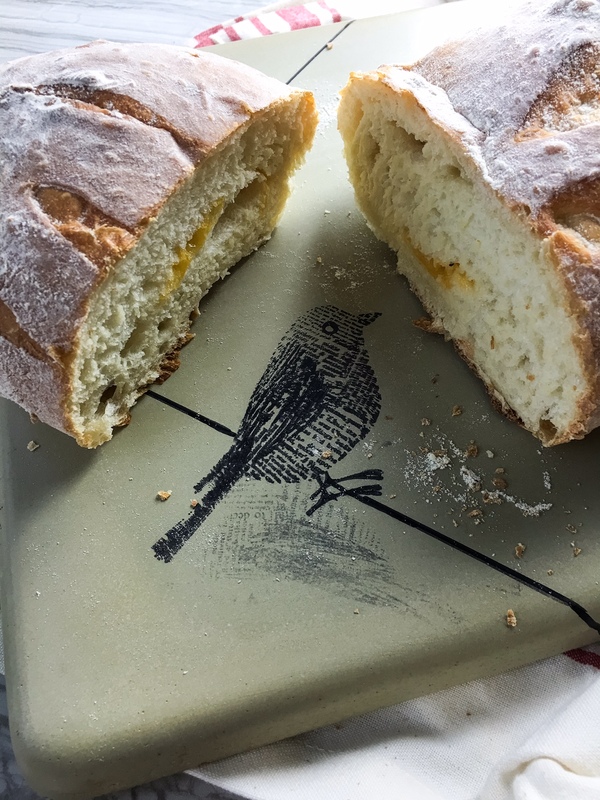 You can definitely make these in a mixer with a dough hook, but I am a perfectionist and I love how my bread machine is slightly warm and allows perfect rising. Are you drooling yet? These really might be my favorite recipe to date. 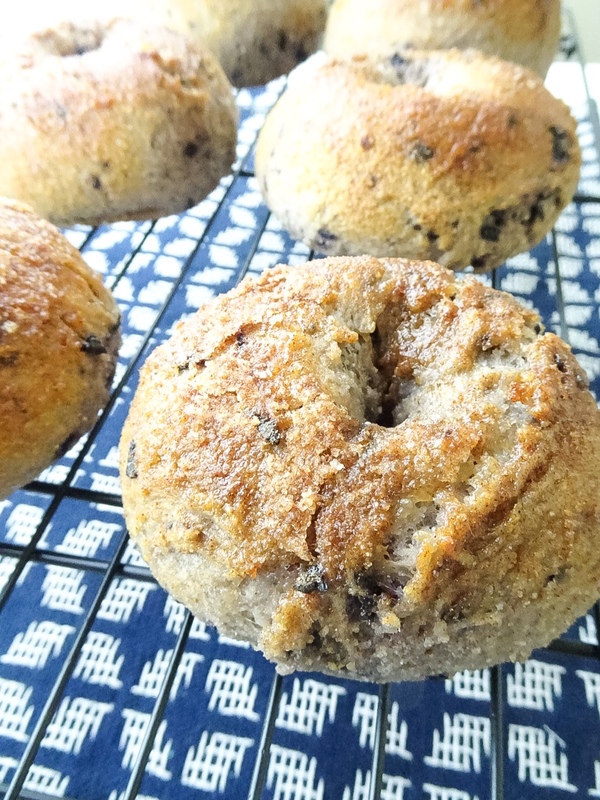 Brown sugar raisin bagels all the way! 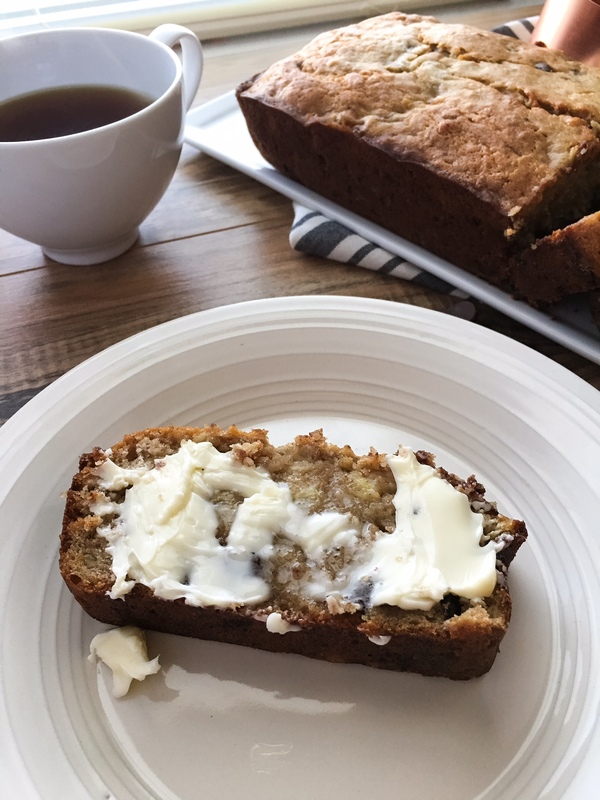 Something about this time of year always has me craving banana bread. It probably has something to do with the fact that I always try and increase my fruit and veggie intake at the beginning of the year. This year we are going to try out whole 30. I am excited to really clean up our diets and detox, but I’m not thrilled about giving up dairy. 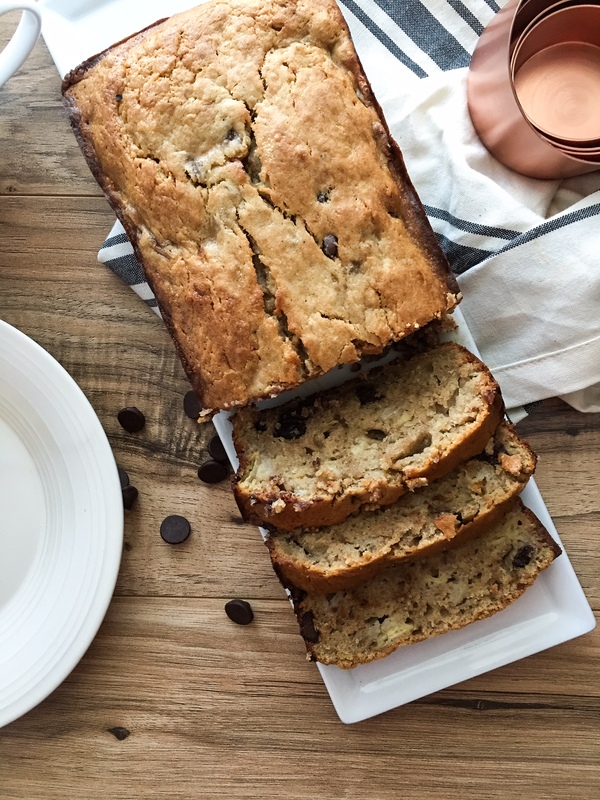 You can obviously skip the dark chocolate to reduce the sugar in this recipe, but I love the way the chocolate melts into the bread. My favorite way to enjoy this bread is toasted with a little butter. There are not a lot of ingredients. I tried to make it as much about the bananas as possible. 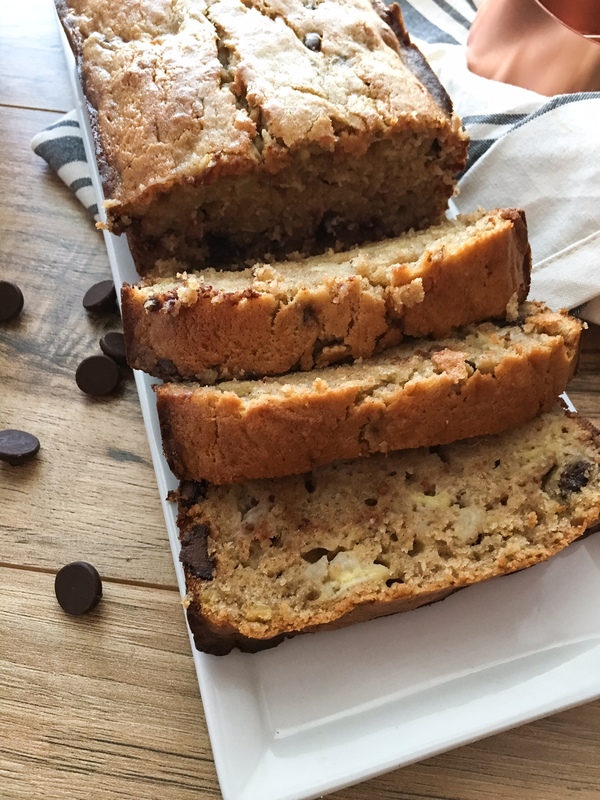 Since this bread is so focused on the bananas you end up with a really moist treat. Nothing is worse then a piece of dry breakfast bread. I think next time I might swap the chocolate out for raisins and pecans. Add the flour and baking soda. I like chunks of banana in mine. Bake for 30-40 minutes or until center is set and bread is golden brown. Something about fresh baked bread just gives my house such a homey feel. We do not eat a lot of bread believe it or not which is really hard on my Italian roots. My mother makes some of the greatest bread I have ever had. 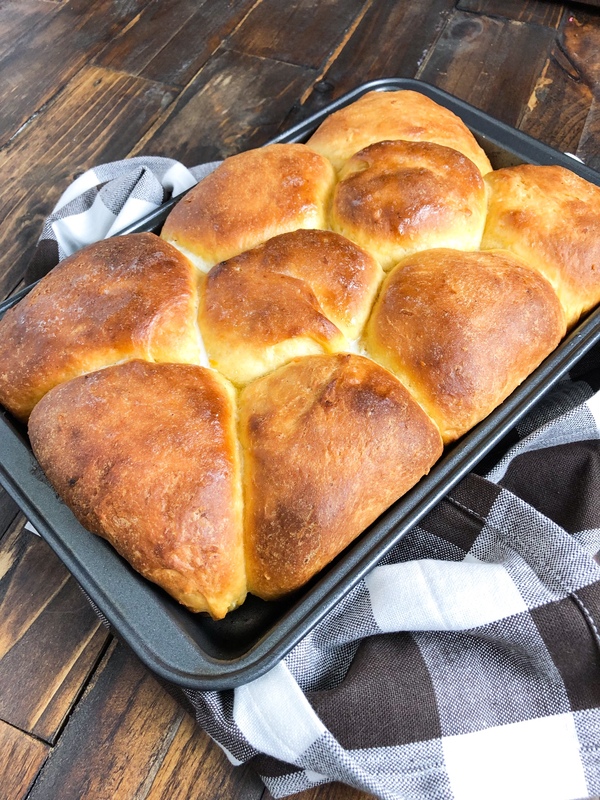 Growing up we always had home made yeast rolls with any special meal. While my family is not a fan of olives, I am obsessed! I love all kinds. The saltier the better. These olives I picked up from a local farmers market. Marinated in garlic, pepper, olive oil and thyme. I added the cheddar for a little creaminess and one more kick of salt. Since I have so much salt added to the bread I added a little extra sugar. It created the perfect balance of flavor in this yeast dough. I let the dough rise on the pan at room temperature then cut my slits into the dough. Then I allowed it to cold rise in the fridge for 30 minutes. I find that allowing the dough to rise in a colder environment gives you a much flakier crust. 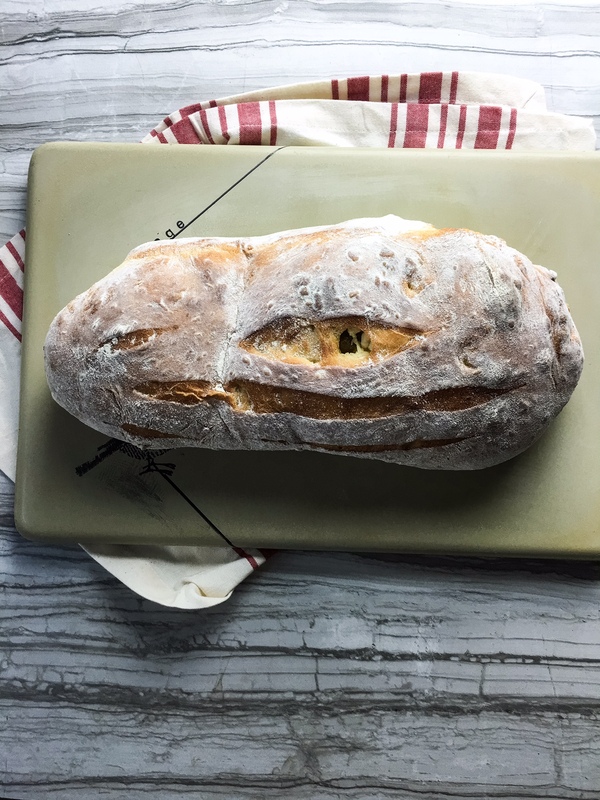 Sweet yeast bread packed with cheddar and olives. I used a bread maker to form my dough. You are welcome to use your hands or a standing mixture with dough hook. In the bread maker bowl I add my yeast, sugar and water. Then I let it sit for about 10 minutes until fragrant and bubbly. I set the bread maker to the dough setting. It kneads for 10 minutes rises for 30 minutes kneads for 10 minutes then rises for 1 hour. After the dough rises for the full 1.5 hours I lay it on a floured surface and lightly flatten. Add the cheese, olives, and garlic to the center. Then fold back up into a ball. I very lightly knead the ingredients into the dough. Then form an oval loaf. Pinch and tuck the ends of the dough to prevent spreading. Let rise on the counter for 15-20 minutes. Score the top with your choice of design. I like doing 3 even cuts down the center about ½ inch down. 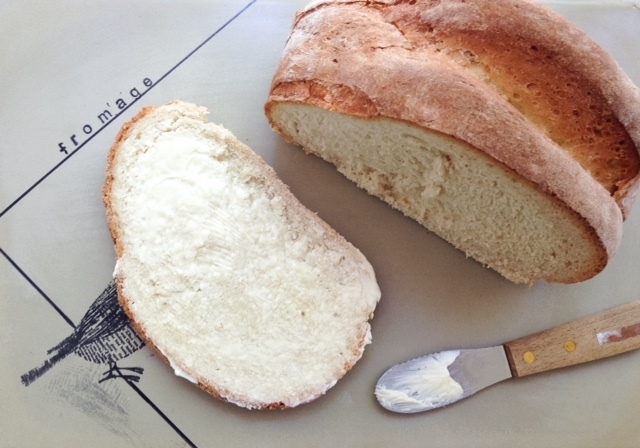 This dough is a great starter for any kind of yeast loaf you want to make. You can add different cheese, herbs, chocolate, really anything you can think of! We had this bread with soup the first night then Patrick sliced it up with fried eggs for the rest of the week. 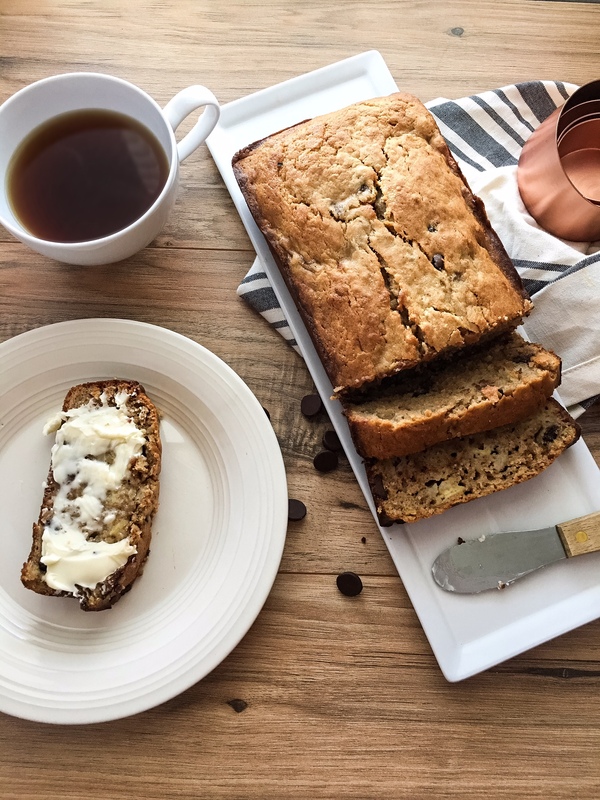 I really hope you try this recipe! Don’t forget to tag me #kelliericecakes if you do! 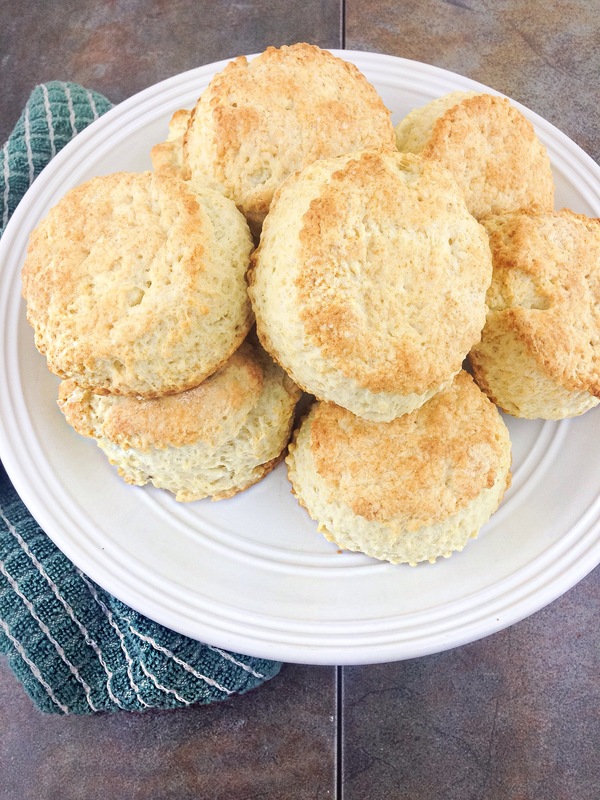 Cream biscuits are the most fool proof recipes that I can find. Sometimes I find recipes that I think will work, but they are too dry or too greasy. 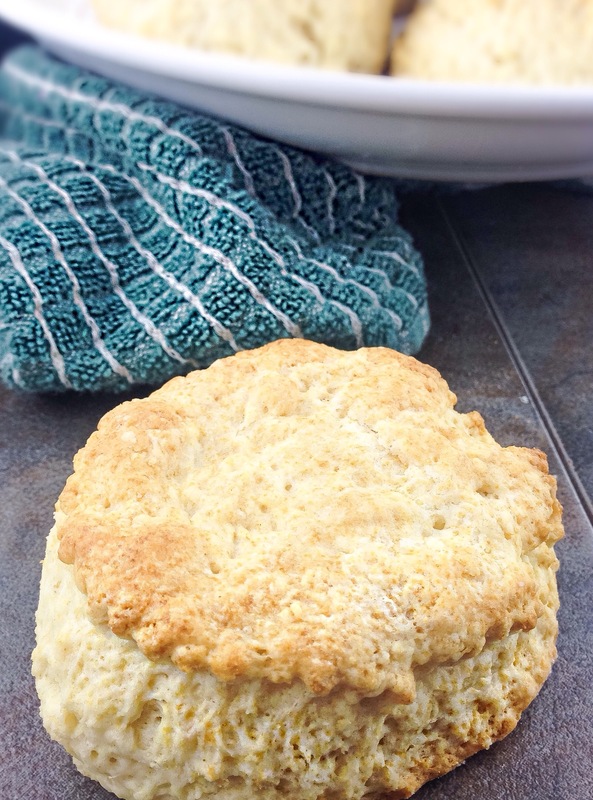 My perfect biscuit has a nice crust, salty sweet flavor, and a soft flaky middle. Needless to say, we broke up about a week later. Now I didn’t know it then, but soon after I found my love of food. 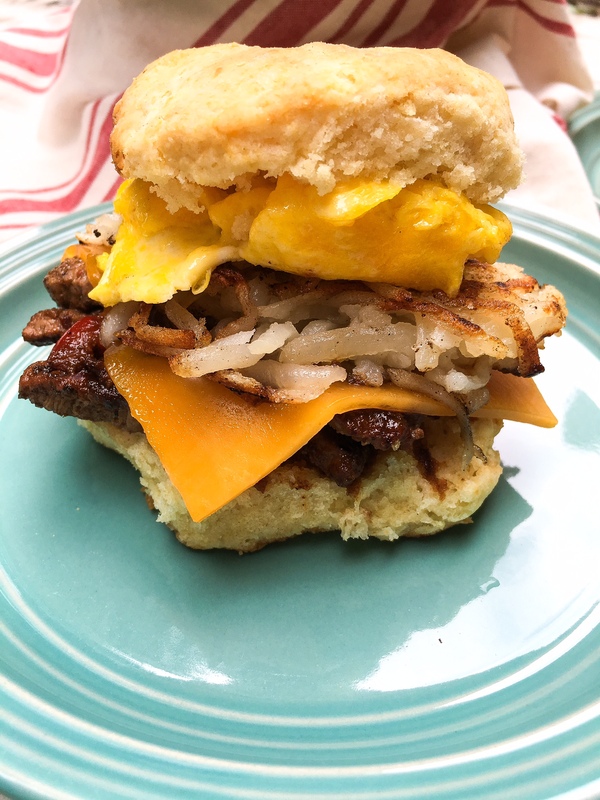 Pretty soon I was not only making biscuits from scratch, but I had created my own go to recipe that was a perfect blend of all that I had learned. If you take anything away from my rambling please remember this- do not twist the biscuit cutter. This had never occurred to me before until I read a great article on Pinterest. (of course) I used to use a glass to cut my biscuit dough. I would twist back and forth until I had formed the perfect shape. I picked up a metal biscuit cutter and now I just press down one time, no twist. This allows the dough to rise and expand. 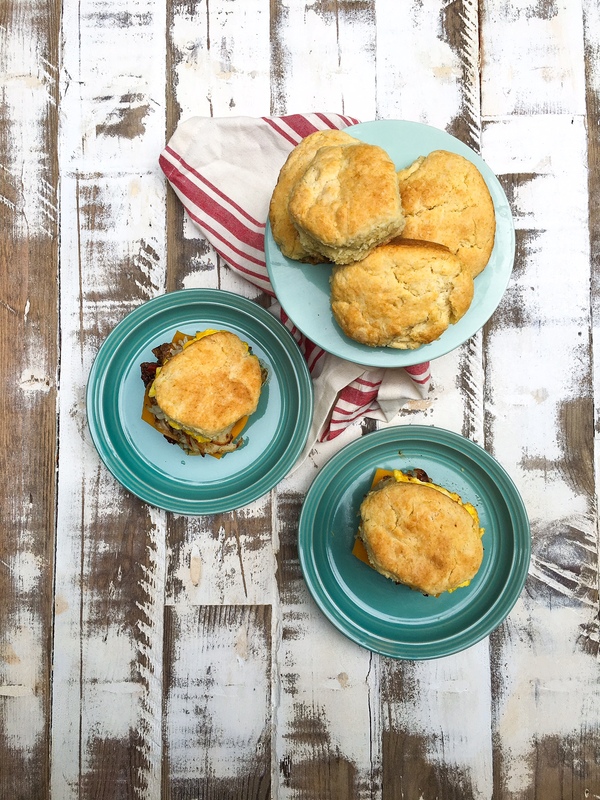 This is how to achieve that mile high biscuit. Cut the butter into the flour. Add in the sugar, baking powder, and cream. Mix with hands until a pliable dough develops. On a floured surface roll out the dough to about 1 and ½ inches thick. Cut as many biscuits as you can. I can usually get 8. Remember - do not twist the cutter! These biscuits keep about 3 days in a ziplock or air tight container. I recommend eating them with ham and eggs! They are my favorite texture for breakfast sandwiches. Enjoy! A few years ago one of my coworkers brought me breakfast. A breakfast that I can never forget. 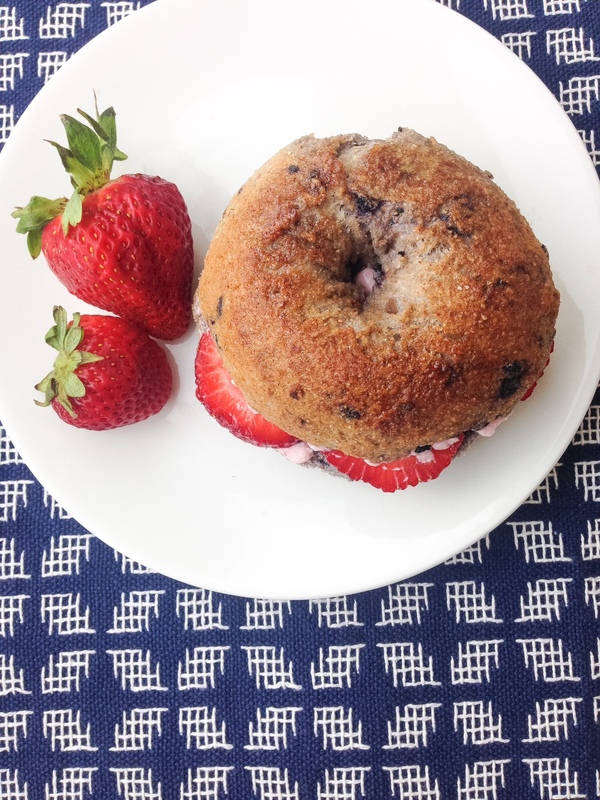 A giant piping hot toasted blueberry bagel overflowing with raspberry cream cheese and fresh strawberries. It was one of the best bagels I have ever eaten. 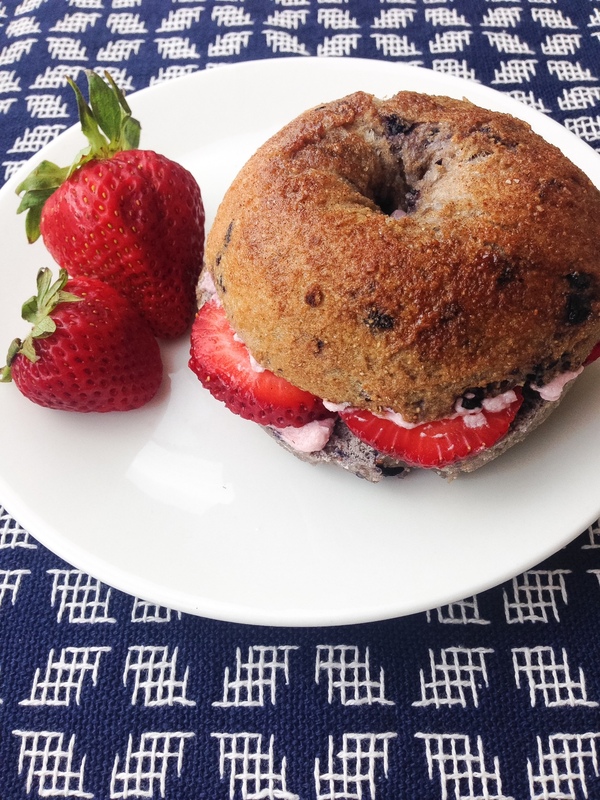 The mix of berries and that perfect chewy bread make the best on the go sandwiches. I wanted to try and incorporate coconut flour to lower the gluten. Since coconut flour is know for absorbing liquid and being slightly dry I still left all purpose flour in the recipe. 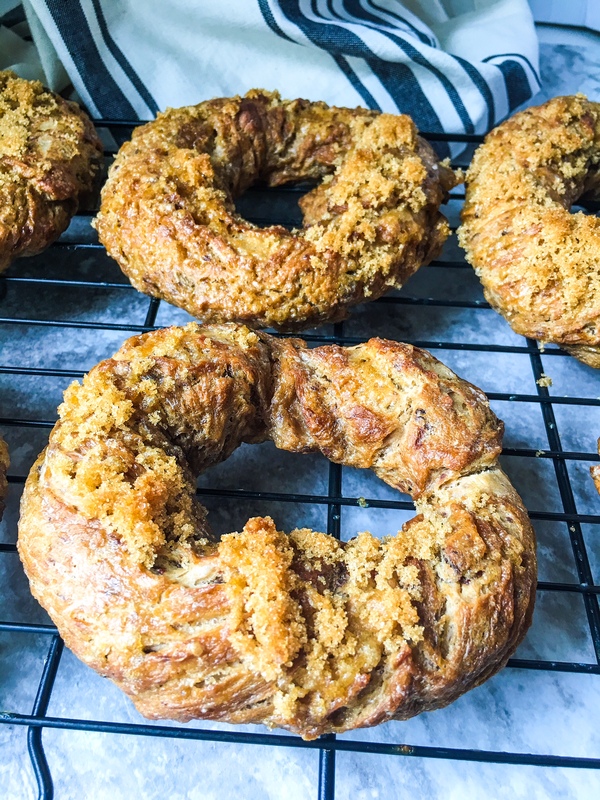 These bagels are so chewy with a great sugar crust. 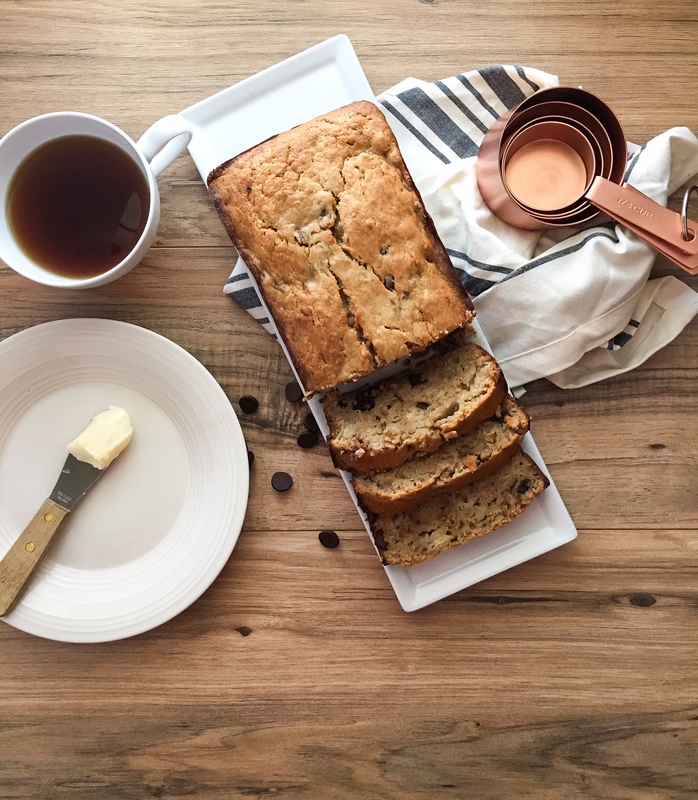 Cinnamon and nutmeg warm up the fresh flavor of the organic blueberries. 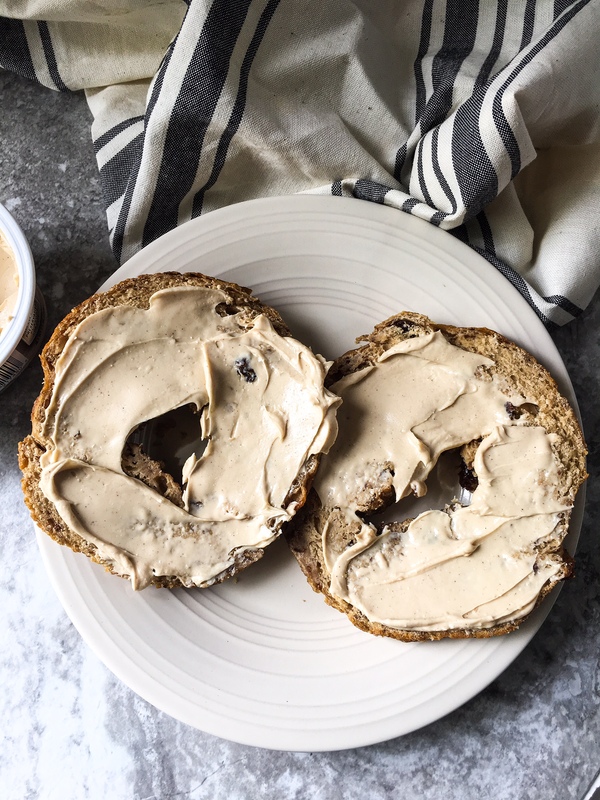 These bagels are not overly sweet so they also pair perfectly with savory sandwiches. I think they would be insanely good with bacon and eggs. Especially some delicious thick cut maple bacon. 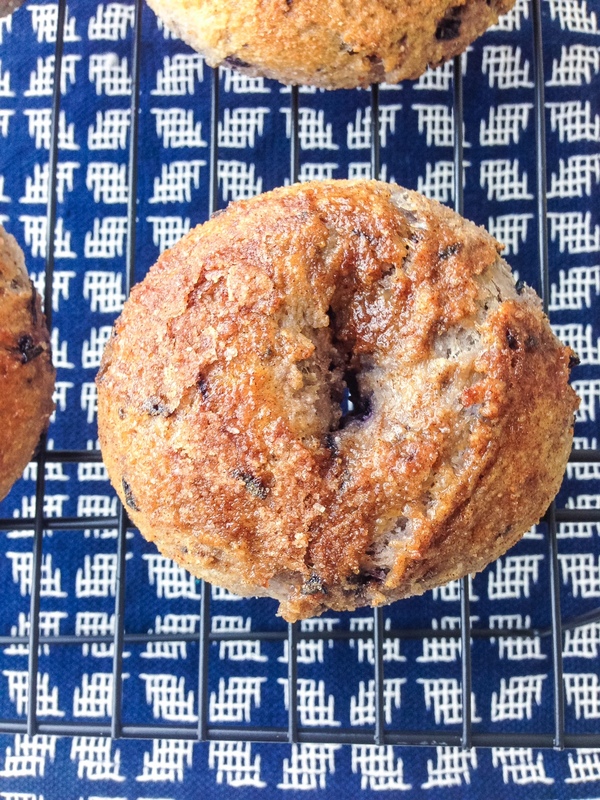 Sweet chewy bagels filled with fresh blueberries. ½ cup of cinnamon and sugar for sprinkling. In a large mixing bowl mix yeast, water, and sugar. Add in butter and egg. Add in the blueberries, AP flour and coconut flour. With a large wooden spoon mix lightly. Add in the nutmeg, cinnamon, and salt. Lightly knead into a ball and cover. Let rise for at least 1 hour. Roll the dough into 6 equal balls for large bagels. Use your finger or the back of the wooden spoon to poke a hole through each ball. Boil on each side for 30 seconds. Scoop out with a slotted spoon and place on large baking sheet. Sprinkled the cinnamon sugar mixture liberally over each bagel. 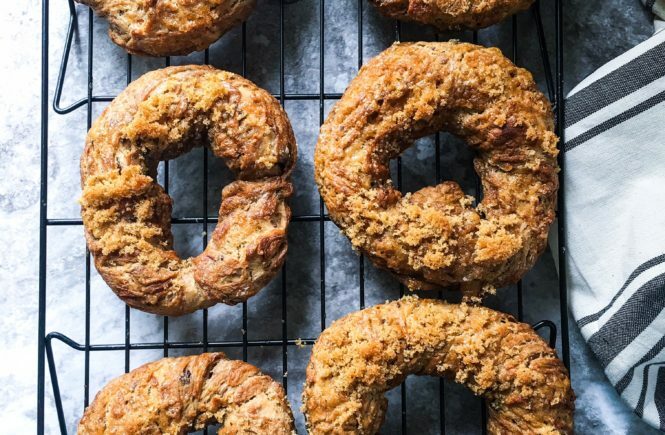 If you do not want to use coconut flour these bagels still come out great with only all purpose flour. I definitely recommend toasting these and loading them up with your favorite ingredients! Do not be intimidated by these. Once you get the hang of bagels they are so easy to make. If you have a bread maker they are even easier. Just remember the longer you boil the dough the chewier and more dense they will become. AH, and so the love affair with my bread maker continues. I am currently working on a few grilled cheese creations for a contest now going on. The first ingredient in a perfect grilled cheese is a nice piece of crusty bread for “grilling”. I was scrolling through recipes online trying to find the ultimate grilled cheese bread. 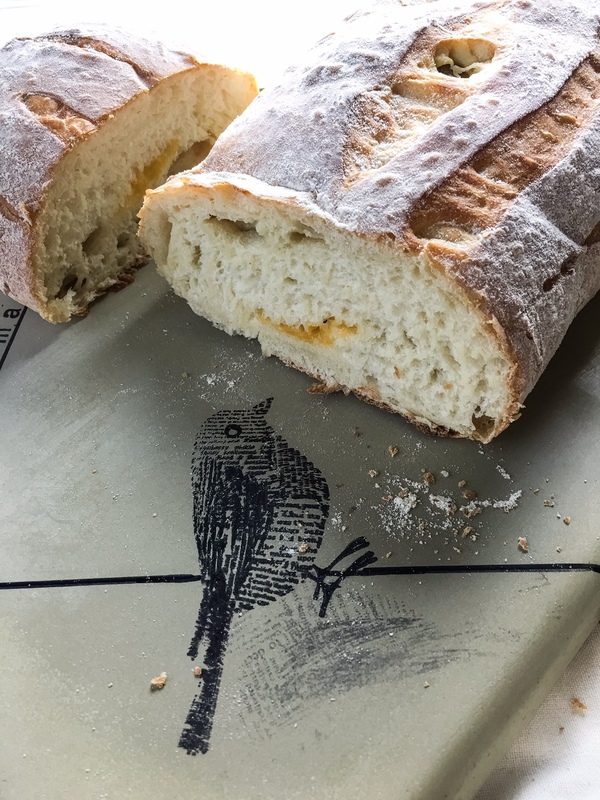 I found myself on the King Arthur website (my favorite place for baking inspiration) and I saw the classic white bread recipe. 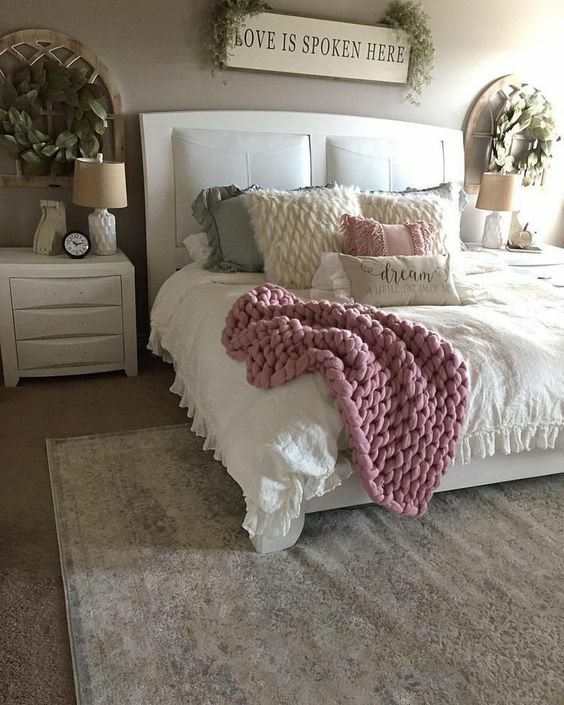 I tweaked it a little bit to fit my needs and because I just can’t ever leave something the way it is. The most important part of this recipe is the rising. Letting this bread rise in the refrigerator is what is going to give you the beautiful brown crust. 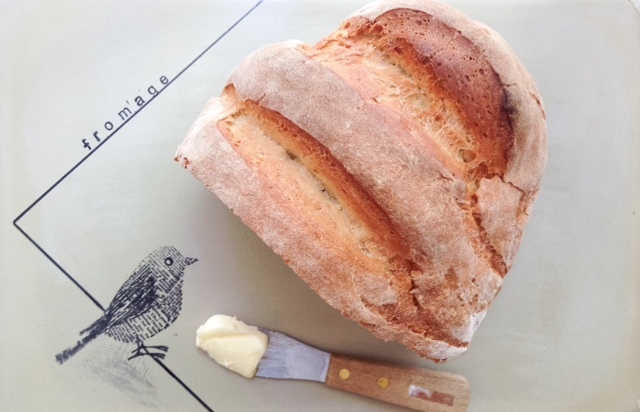 Rustic country white bread. Light and airy center with a rich crunchy crust. Dump yeast, sugar and water into your mixer or bread maker. Let the yeast sit for 10 minutes until bubbling slightly. Add in the flour and slowly mix in a cup at a time with dough hook attachment. If you are using a bread mixture just add in all the flour and salt and start on dough setting. Once the dough starts to form a ball let rise at room temp for 1 -2 hours or until doubled. Flour your hands then shape your dough on a sheet pan. I chose a classic oblong shape. 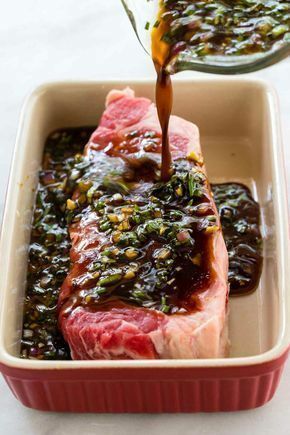 Let rise in the refrigerator for 1 hour. Slit the top of the bread with a knife about 5 times ¼ inch deep or less. Let rise for another 30 minutes at room temp. Place a roasting pan filled with water on the bottom rack. Put the bread on the top rack. Bake for 20-30 minutes or until deep golden brown. 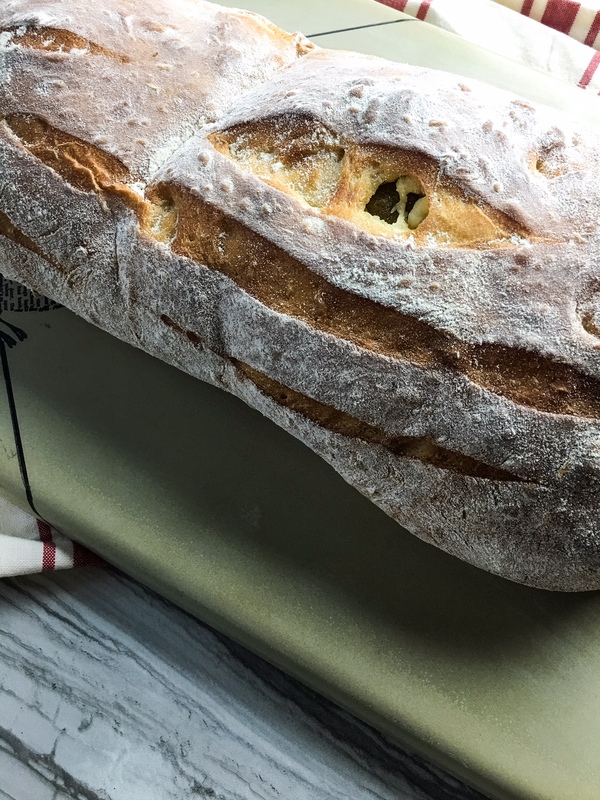 This bread would also be great for french toast! To store just keep in a container or plastic bag for up to a week. Tag me if you try it!